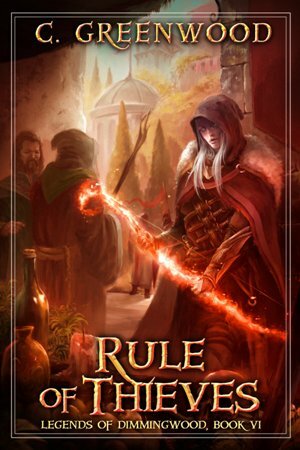 Hey Readers, it’s giveaway time! 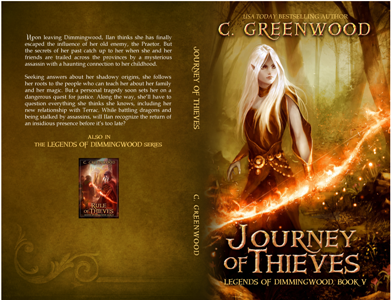 To celebrate a recent milestone for the Legends of Dimmingwood series (half a million copies now in the wild!) 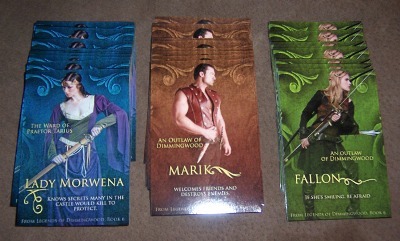 I’m giving fun prizes to three random readers. The first place winner will receive this fierce dragon claw, measuring roughly 5 inches long and made of resin and powdered marble. 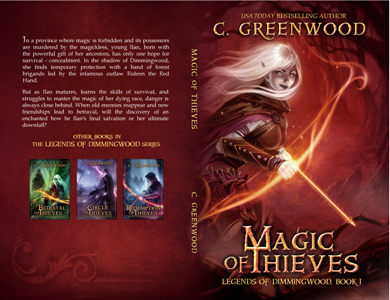 Second and third place winners will receive these collectable fantasy trading cards, featuring characters from my upcoming Rule of Thieves: Legends of Dimmingwood, Book Six. To enter to win one of these prizes, drop any comment below. Please include the email address you can be reached at, if your name is selected. Good luck! 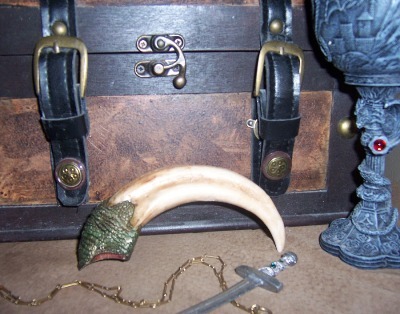 * This giveaway is open to subscribers of my blog, newsletter, advance readers list, Facebook page, Facebook group (The Thieves Den) and generally anyone who yearns for a good dragon claw. 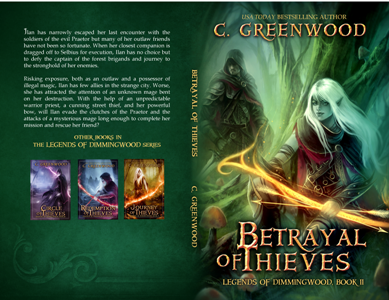 Quick update: the print editions of Legends of Dimmingwood books 1-5 are getting cover makeovers! Front covers remain the same but the backs are all new. Over the next few weeks, these colorful versions will be replacing the old, solid black covers. 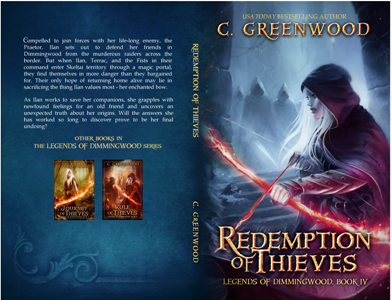 I hope readers enjoy the new look as much as I do! 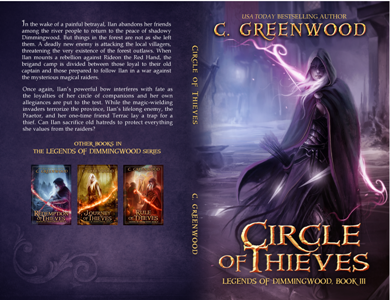 * The forest of Dimmingwood and the city of Selbius, from Dimmingwood books 1 & 2 (Magic of Thieves and Betrayal of Thieves). 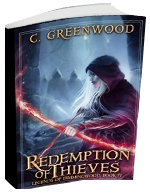 * The unlucky village of Hammond’s Bend from book 3 (Circle of Thieves) and the Skeltai wilderness/Black Forest from book 4 (Redemption of Thieves). 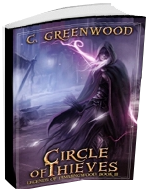 * There’s also Swiftsfell and the Desert of Vipers, from book 5 (Journey of Thieves). 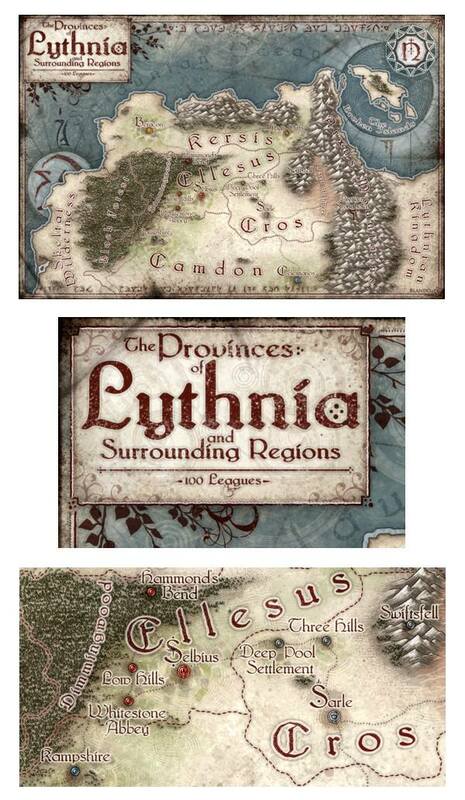 * And to the very far right, readers of Mistress of Masks (Catalysts of Chaos, book 1) might recognize the Lythnian coast. I don’t really have any other news, I just wanted to post this cool banner. 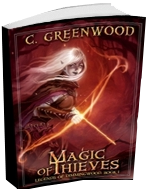 Now the fun stuff, how can you snag a free copy of this bundle? Easy peasy. Visit our ThunderClapIt campaign (by clicking HERE) and become a supporter. It’s free and it only takes a few seconds. The first 200 supporters will receive an email with a free copy of the bundle. But what exactly is included in this bundle? Here’s the description! Let’s see, what else? The bundle will be available for preorder on retailers everywhere March 10th. Until then, the preorder is exclusively available on Apple’s iBooks store HERE. I think that’s all for now. Happy reading and have a great February, everyone! 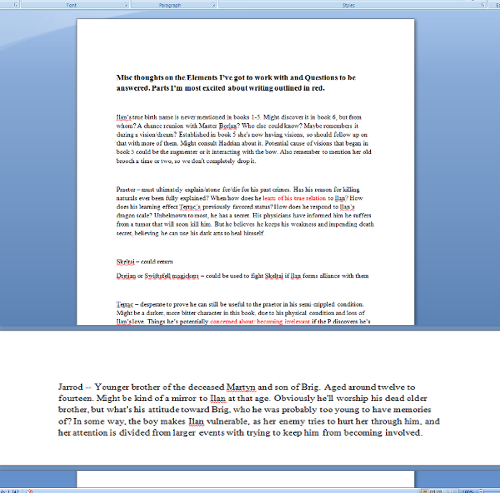 And to prove I’m hard at work on that, here’s a frustratingly tiny sneak peek at the outline for the work-in-progress. The parts I’m most excited about are outlined in red. (Yes, now I’m just being mean. ) In other news, I’m planning a fun giveaway to coincide with the upcoming release and I’ve got another multi-author bundle coming up soon, so keep an eye out for those! I’m super excited to have been able to participate in yet another multi-author fantasy bundle! This has been an awesome group effort and I’ve loved interacting with all the authors involved – and let’s face it, putting together a book this massive is just fun! Lots of thanks to Terah Edun and KJ Colt for making this happen and to Daniel Arenson, Megg Jensen, Annie Bellet, and Ed Robertson for being familiar faces. Lindsay Buroker, Brian Anderson and Joseph Lallo, I’ve long admired from afar (in a very uncreepy way), and Dima Zales, Anna Zaires, David Adams, Mande Matthews, and Jeff Gunzel I’m excited to have gotten to know better. Available for pre-order from: Amazon, B&N, Kobo, and iBooks. * Pre-order for Amazon Kindle only. Paperbacks and other formats will be available from other retailers on or after December 21st. 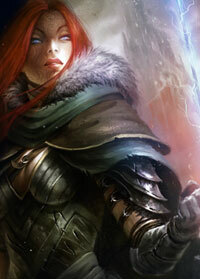 Upon leaving Dimmingwood, Ilan thinks she has finally escaped the influence of her old enemy, the Praetor. 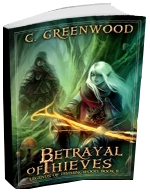 But the secrets of her past catch up to her when she and her friends are trailed across the provinces by a mysterious assassin with a haunting connection to her childhood. Seeking answers about her shadowy origins, she follows her roots to the people who can teach her about her family and her magic. 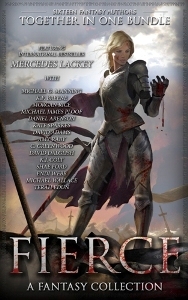 But a personal tragedy soon sets her on a dangerous quest for justice. Along the way, she’ll have to question everything she thinks she knows, including her new relationship with Terrac. While battling dragons and being stalked by assassins, will Ilan recognize the return of a more insidious presence before it’s too late? 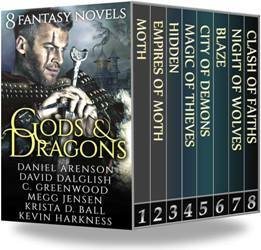 High fantasy at its finest! 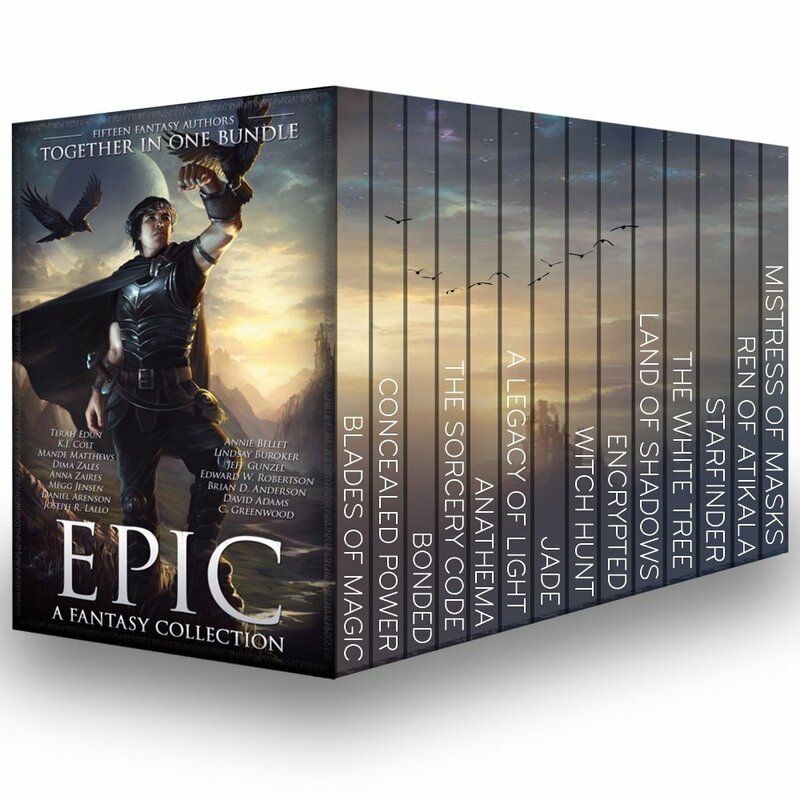 Demons, goddesses, dragons, outlaws and paladins—find everything you love in a great adventure in this bundle of 8 full-length novels. Technically it’s only been release day for 55 minutes but that’s good enough. 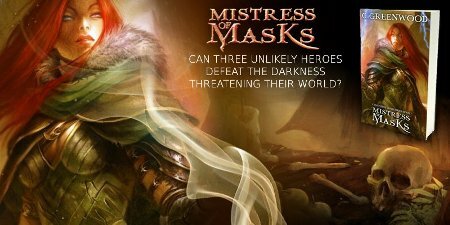 Mistress of Masks is out now, launching the start of my new Catalysts of Chaos series! You can find the book at Amazon, B&N, and Kobo. Other formats are available at Smashwords. 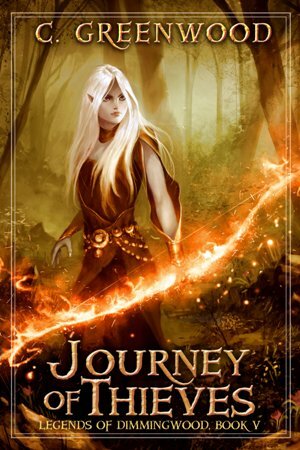 I hope all my readers enjoy getting to know these new characters and exploring the world of Earth Realm.